Ingredients: Aqua, Ethylhexyl Methoxycinnamate, Glyceryl Stearate SE, Propylene Glycol, Titanium Dioxide, Benzophenone-3, Glycerin, Dimethicone, Cetearyl Alcohol, Tocopheryl Acetate (Vitamin E), Polyacrylamide, C13-14 Isoparaffin, Laureth-7, Polysorbate 80, Imidazolidinyl Urea, Phenoxyethanol, Caprylyl Glycol. Properties: Diana® Sun Screen Cream, ith its unique formula, protects the skin, nourishes it and helps maintain its softness, it also makes a good base for make up. Directions for Use: Apply it onto face and body as needed, re-apply after swimming, excessive perspiration and towel drying. Ingredients: Aqua, Glycerin, Caprylic/ Capric Triglyceride, Cetearyl Alcohol, Glyceryl Stearate SE, Dimethicone, Propylene Glycol, Isopropyl Myristate, Caffeine, Bis-Diglyceryl Polyacyladipate-2, Imidazolidinyl Urea, Phenoxyethanol, Caprylyl Glycol, Butylphenyl Methylpropional, Geraniol, Hexyl Cinnamal, Hydroxyisohexyl 3-Cyclohexene Carboxaldehyde, Limonene, Linalool, Parfum. Properties: Diana® Hand Hydrating Cream is an intense moisturizer that nourishes, softens, strengthens and protects the skin. Regular application of this product gives your hands a soft, silky and beautiful skin texture. Directions for Use: Wash your hands. Gently massage a small amount of the cream until fully absorbed. Use daily as desired. Ingredients: Aqua, Lactic Acid, Cetearyl Alcohol, Propylene Glycol, Glycerin, Mineral Oil (Paraffinum Liquidum), Ceteareth-20, Chamomilla Recutita (Matricaria) Flower Extract, Morus Nigra (Mulberry) Leaf Extract, Arctostaphylos Uva Ursi (Bearberry) Leaf Extract, Citrus Limon (Lemon) Peel Extract, Glycyrrhiza Glabra (Licorice) Root Extract, Tocopheryl Acetate (Vitamin E), Dimethicone, Allantoin, Ceteareth-12, Sodium Lauryl Sulfate, Sodium Cetearyl Sulfate, Potassium Sorbate, Imidazolidinyl Urea, Phenoxyethanol, Caprylyl Glycol, Alpha-Isomethyl Ionone, Benzyl Salicylate, Parfum. 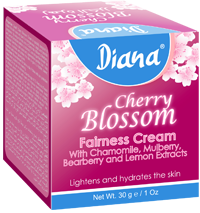 Properties: Diana® Cherry Blossom Cream is specially designed to lighten the skin color and give it a homogeneous, bright and beautiful complexion. Its unique formula, rich in Chamomile, Mulberry, Bearberry, Lemon and Licorice Extracts in addition to Vitamin E, not reduces the appearance of blemishes, dark spots and pigmentation patches, but it also hydrates, nourishes and softens the skin to give it a lighter, clearer, healthier and a more glowing look. Directions for Use: Recommended for twice a day. Follow with sun protection cream when applied in the morning. Ingredients: Aqua, Propylene Glycol, Cetearyl Alcohol, Glycerin, Mineral Oil (Paraffinum Liquidum), Glyceryl Stearate SE, Lavandula Angustifolia (Lavender) Oil, Aloe Barbadensis (Aloe Vera) Leaf Juice, Cucumis Sativus (Cucumber) Juice, Acetyl Dipeptide-1 Cetyl Ester, Tocopheryl Acetate (Vitamin E), Dimethicone, Allantoin, Laureth-3, Hydroxyethylcellulose, Butylene Glycol, Potassium Cetyl Phosphate, Ceteareth-12, Ceteareth-20, BHT, Potassium Sorbate, Imidazolidinyl Urea, Phenoxyethanol, Caprylyl Glycol. 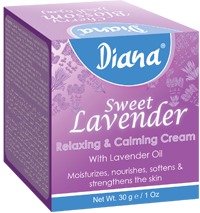 Properties: Diana® Sweet Lavender Cream is specially formulated to soothe, moisturize, nourish, soften and strengthen the skin. Its unique formula, rich in Lavender Oil, Calmosensine, Cucumber Extract, Aloe Vera Extract and Vitamin E, and free of parabens, synthetic fragrances or colors offers the skin a moment of pure relaxation and well-being. Directions for Use: Recommended for use daily before bedtime. Ingredients: Prunus Amygdalus Dulcis (Sweet Almond) Oil, Beeswax, Bismuth Subnitrate, Salicylic Acid, Glycyrrhiza Glabra (Licorice) Root Extract, Phenoxyethanol, Caprylyl Glycol, Amyl Cinnamal, Benzyl Benzoate, Hexyl Cinnamal, Parfum. 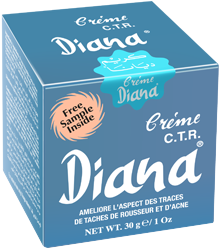 Properties: Diana® Crème CTR, a specially formulated cream, lightens the skin and improves the appearance of marks caused by freckles, blackheads and acne. It leaves the skin feeling soft, smooth and refreshed. Directions for Use: Cleanse skin. Gently massage a small amount of the cream before bedtime. Wash off the cream in the morning. For maximum results, use consecutively for a few weeks. Ingredients: Aqua, Propylene Glycol, Glycerin, Morus Nigra (Mulberry) Leaf Extract, Citrus Limon (Lemon) PeelExtract, Glycyrrhiza Glabra (Licorice) Root Extract, Phenylethyl Resorcinol, Titanium Dioxide, Tocopheryl Acetate (Vitamin E), Allantoin, Polyacrylamide, C13-14 Isoparaffin, Laureth-7, Ceteareth 20- Cetearyl Alcohol, Sodium Lauryl Sulfate, Sodium Cetearyl Sulfate, Tetrasodium EDTA, BHT, Potassium Sorbate, Imidazolidinyl Urea, Phenoxyethanol, Caprylyl Glycol. Uses: Diana® Bright lightens dark spots in the skin such as freckles, sunspots, age spots, and abnormal pigmentation patches caused by sun exposure. Directions for Use: Cleanse skin. Gently massage a small amount of the cream onto the darkened area. Use mornings and evenings. For maximum results, use consecutively for a few weeks. Ingredients: Aqua, Propylene Glycol, Cetearyl Alcohol, Glycerin, Mineral Oil (Paraffinum Liquidum), 4-Butyl Resorcinol, Morus Nigra (Mulberry) Leaf Extract, Citrus Limon (Lemon) Peel Extract, Glycyrrhiza Glabra (Licorice) Root Extract, Titanium Dioxide, Tocopheryl Acetate (Vitamin E), Benzophenone-3, Dimethicone, Allantoin, Potassium Cetyl Phosphate, Glyceryl Stearate SE, Polyacrylamide, C13-14 Isoparaffin, Laureth-7, Ceteareth- 12, Ceteareth-20, Tetrasodium EDTA, BHT, Potassium Sorbate, Imidazolidinyl Urea, Phenoxyethanol, Caprylyl Glycol. 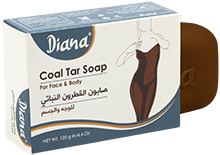 Uses: Diana® Beauty Cream lightens dark spots in the skin such as freckles, sunspots, age spots, and abnormal pigmentation patches caused by sun exposure. Ingredients: Aqua, Titanium Dioxide, Glyceryl Stearate SE, Glycerin, Propylene Glycol, Cetearyl Alcohol, Dimethicone, Isopropyl Myristate, Mineral Oil, Ethylhexyl Methoxycinnamate, Ceteareth-12, Ceteareth-20, Polysorbate 80, Imidazolidinyl Urea, Phenylpropanol, Methylisothiazolinone, C.I.77491, C.I.77492, C.I.77499. Properties: Diana® Foundation Cream achieves your desired skin complexion as it blends smoothly for an even skin tone. It is a perfect make-up base with great effect in covering dark spots, wrinkles and blemishes. Ingredients: Aqua, Propylene Glycol, Glycerin, Morus Nigra (Mulberry) Leaf Extract, Citrus Limon (Lemon) Peel Extract, Glycyrrhiza Glabra (Licorice) Root Extract, Phenylethyl Resorcinol, Titanium Dioxide, Tocopheryl Acetate (Vitamin E), Allantoin, Polyacrylamide, C13-14 Isoparaffin, Laureth-7, Cetearyl Alcohol, Ceteareth-20, Sodium Lauryl Sulfate, Sodium Cetearyl Sulfate, Tetrasodium EDTA, BHT, Potassium Sorbate, Imidazolidinyl Urea, Phenoxyethanol, Caprylyl Glycol, Alpha-Isomethyl Ionone, Citronellol, Eugenol, Geraniol, Limonene, Parfum. 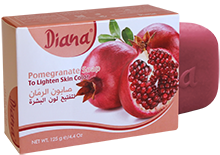 Properties: Diana® Skin Lightening Cream for Sensitive Areas is specially formulated to gently lighten the skin color of sensitive areas such as the underarms. Its soft and effective formula, which contains a variety of plant extracts, gives a more radiant and more beautiful skin complexion. Directions for Use: Apply a small amount of the cream onto the skin. Gently massage in circular motion until fully absorbed. Use minimum once a day. Ingredients: Aqua, Ethylhexyl Methoxycinnamate, Glycerin, Cetearyl Alcohol, Propylene Glycol, Benzophenone-3, Dimethicone, 4-Butylresorcinol, Titanium Dioxide, Tocopheryl Acetate (Vitamin E), Glyceryl Stearate SE, Potassium Cetyl Phosphate, Ceteareth-12, Ceteareth-20, BHT, Imidazolidinyl Urea, Phenoxyethanol, Caprylyl Glycol, Parfum. 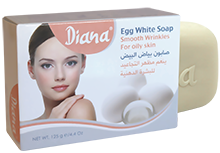 Properties: Diana® Skin Lightening Cream lightens dark spots on the skin such as freckles, sun spots and age spots. It also protects the skin against UVA/UVB sun-rays. Ingredients: Aqua, Propylene Glycol, Cetearyl Alcohol, Glycerin, Salicylic Acid, Polyacrylate Crosspolymer-6, Mineral Oil (Paraffinum Liquidum), Hamamelis Virginiana (Witch Hazel) Leaf Extract, Rosmarinus Officinalis (Rosemary) Leaf Extract, Thymus Vulgaris (Thyme) Flower/Leaf Extract, Salvia Officinalis (Sage) Extract, Humulus Lupulus (Hops) Extract, Dimethicone, Allantoin, Ceteareth-20, Sodium Lauryl Sulfate, Sodium Cetearyl Sulfate, Potassium Sorbate, Imidazolidinyl Urea, Phenoxyethanol, Caprylyl Glycol, Benzyl Salicylate, Hexyl Cinnamal, Hydroxycitronellal, Linalool, Parfum. Properties: Diana® Mild Peeling Facial Cream for acne prone skin cleanses the skin, removes oil and gives you a healthy and beautiful complexion. Directions for Use: Apply the cream twice a day onto the skin, follow with sun protection when applied in the morning. Ingredients: Aqua, Glycerin, Cetearyl Alcohol, Propylene Glycol, Mineral Oil, Urea, Hydrolyzed Collagen, Gamma Aminobutyric Acid (GABA), Dimethicone, Ceteareth-20, Sodium Lauryl Sulfate, Sodium Cetearyl Sulfate, Imidazolidinyl Urea, Phenylpropanol, Methylisothiazolinone, Parfum. Properties: Diana® Botox Cream is one of the best solutions to give every woman the young attractive look that she desires. Its unique formula, rich in Natural Collagen and GABA, deeply penetrates the skin and effectively reduces frown lines length, dark circles and age spots. Diana® Botox Cream improves skin’s smoothness, radiance and elasticity and gives it a plumper, firmer and well-hydrated complexion. Directions for Use: Apply a small amount of the cream onto the face. Gently massage in circular motion until fully absorbed. Use twice a day. When applied in the morning, follow with sun protection. Results start showing from the first four weeks. Avoid contact with eyes. Ingredients: Aqua, Cetearyl Alcohol, Propylene Glycol, Mineral Oil, Glycerin, Hydrolyzed Collagen, Hydrolyzed Sesame Protein PG-Propyl Methylsilanediol, Dimethicone, Ceteareth-20, Sodium Lauryl Sulfate, Sodium Cetearyl Sulfate, Acrylates Copolymer, VP/Polycarbamyl Polyglycol Ester, Imidazolidinyl Urea, Phenylpropanol, Methylisothiazolinone, Parfum. Properties: Diana® Breast Lifting Cream is one of the best solutions to attain fuller and firmer breasts. Its unique formula, rich in Natural Collagen and Sesame Protein, refines and firms the breast contours to give you a more voluminous, attractive and beautiful look. Enhance your natural beauty, obtain a softer and smoother texture, and get the shape you desire with Diana® Breast Lifting Cream. Directions for Use: Apply a small amount of the cream onto the breasts. Gently massage in circular motion until fully absorbed. Use twice a day. Results start showing from the first four weeks. Ingredients: Aqua, Tocopheryl Acetate (Vitamin E), Cetearyl Alcohol, Propylene Glycol, Glycerin, Mineral Oil (Paraffinum Liquidum), Dimethicone, Allantoin, Glyceryl Stearate SE, Potassium Cetyl Phosphate, Ceteareth-12, Ceteareth-20, Sodium Lauryl Sulfate, Sodium Cetearyl Sulfate, Carbomer, BHT, Imidazolidinyl Urea, Phenoxyethanol, Caprylyl Glycol, Coumarin, Hydroxyisohexyl 3-Cyclohexene Carboxaldehyde, Limonene, Parfum. 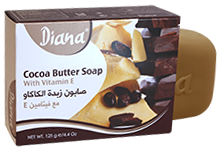 Properties: Diana® Vitamin E Cream nourishes, moisturizes and gives your skin a relaxed and healthy look and feel. 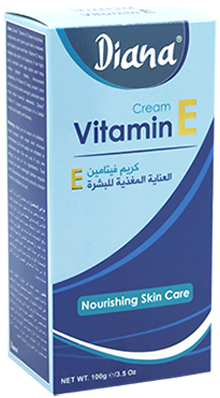 Vitamin E helps maintain the skin’s oil balance and its antioxidant properties help protect your skin from ultra violet sunlight, pollution and many other harmful elements. This product contributes to a better overall skin health and beauty. Directions for Use: Gently massage a small amount of the cream on the desired area. When applied in the morning onto face, follow with sun protection. Use twice a day and as necessary. Avoid contact with eyes. Ingredients: Aqua, Propylene Glycol, Cetearyl Alcohol, Glycerin, Salicylic Acid, Hamamelis Virginiana (Witch Hazel) Leaf Extract, Rosmarinus Officinalis (Rosemary) Leaf Extract, Thymus Vulgaris (Thyme) Flower/Leaf Extract, Melaleuca Alternifolia (Tea Tree) Leaf Oil, Serenoa Serrulata (Saw Palmetto) Fruit Extract, Dimethicone, Mineral Oil (Paraffinum Liquidum), Ceteareth-20, Polyacrylate Crosspolymer-6, Sodium Cetearyl Sulfate, Sodium Lauryl Sulfate, Potassium Sorbate, Imidazolidinyl Urea, Phenoxyethanol, Caprylyl Glycol. Directions For Use: Apply cream on Blackheads spots, twice a day, and rub gently. Ingredients: Aqua, Glycerin, Propylene Glycol, Cetearyl Alcohol, Mineral Oil (Paraffinum Liquidum), Urea, Aloe Barbadensis (Aloe Vera) Leaf Juice, Arnica Montana Flower Extract, Tocopheryl Acetate (Vitamin E), Panthenol (Provitamin B5), Dimethicone, Allantoin, Glyceryl Stearate SE, Potassium Cetyl Phosphate, Ceteareth-12, Ceteareth-20, BHT, Potassium Sorbate, Imidazolidinyl Urea, Phenoxyethanol, Caprylyl Glycol, Parfum. 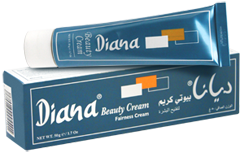 Properties: Diana® Hydrating Cream is specially formulated to moisturize, nourish, soften and strengthen your skin. Its unique formula, with Vitamin E, Provitamin B5 and a variety of plant extracts, provides your skin with the necessary protection against roughness, redness, wrinkles and fine lines. Regular application of this product gives your skin a healthy and beautiful look. Directions for Use: Cleanse your skin. Gently massage a small amount of the cream until fully absorbed. Use daily as needed. Could be used on face, neck and hands. Provides 24-hour intense skin hydration. Ingredients: Aqua, Propylene Glycol, Cetearyl Alcohol, Glyceryl Stearate SE, Glycerin, Prunus Amygdalus Dulcis (Sweet Almond) Oil, Urea, Methyl Gluceth-20, Ethylhexyl Methoxycinnamate, Chamomilla Recutita (Matricaria) Flower Extract, Centella Asiatica (Gotu Kola) Leaf Extract, Equisetum Arvense (Horsetail) Extract, Humulus Lupulus (Hops) Extract, Arnica Montana Flower Extract, Tocopheryl Acetate (Vitamin E), Dimethicone, Benzophenone-3, Allantoin, Ceteareth-12, Ceteareth-20, PEG-20 Methyl Glucose Sesquistearate, Methyl Glucose Sesquistearate, Carbomer, BHT, Potassium Sorbate, Imidazolidinyl Urea, Phenoxyethanol, Caprylyl Glycol, Alpha-Isomethyl Ionone, Benzyl Salicylate, Butylphenyl Methylpropional, Citronellol, Limonene, Geraniol, Hydroxycitronellal, Parfum. Properties: Diana® Day Cream is specially formulated to hydrate, nourish and protect your skin all day long. Its unique formula, with Vitamin E and a variety of plant extracts, along with UVA/UVB protection factors, keeps your skin soft, smooth, refreshed and well guarded against harmful effects of the sun. Regular application of this product provides the best defense against signs of aging. Directions for Use: Cleanse your skin. Gently massage a small amount of the cream until fully absorbed. Use daily. Ingredients: Aqua, Glycerin, Propylene Glycol, Cetearyl Alcohol, Glyceryl Stearate SE, Prunus Amygdalus Dulcis (Sweet Almond) Oil, Urea, Methyl Gluceth-20, Butyrospermum Parkii (Shea Butter), Theobroma Cacao (Cocoa) Seed Butter, Equisetum Arvense (Horsetail) Extract, Centella Asiatica (Gotu Kola) Leaf Extract, Chamomilla Recutita (Matricaria) Flower Extract, Ginkgo Biloba Leaf Extract, Tocopheryl Acetate (Vitamin E), Panthenol (Provitamin B5), Dimethicone, Allantoin, Ceteareth-12, Ceteareth-20, PEG-20 Methyl Glucose Sesquistearate, Methyl Glucose Sesquistearate, Carbomer, BHT, Potassium Sorbate, Imidazolidinyl Urea, Phenoxyethanol, Caprylyl Glycol, Alpha-Isomethyl Ionone, Benzyl Salicylate, Butylphenyl Methylpropional, Citronellol, Limonene, Geraniol, Hydroxycitronellal, Parfum. 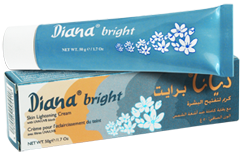 Properties: Diana® Night Cream is specially formulated to moisturize, strengthen and refresh your skin during the night. Its unique formula, with Vitamin E, Provitamin B5, Shea Butter, Cocoa Butter as well as a variety of plant extracts, replenishes your skin and restores its moisture to give it a firmer and brighter look. Regular application of this product gives your skin a well-rested, healthier and more beautiful look in the morning. Ingredients: Aqua, Glyceryl Stearate SE, Ethylhexyl Methoxycinnamate, Propylene Glycol, Titanium Dioxide, Glycerin, Benzophenone-3, Dimethicone, Cetearyl Alcohol, Butyl Methoxydibenzoylmethane, Aloe Barbadensis (Aloe Vera) Leaf Juice, Camellia Sinensis (Green Tea) Leaf Extract, Tocopheryl Acetate (Vitamin E), Sodium Ascorbyl Phosphate (Vitamin C), Polysorbate 80, Potassium Sorbate, Imidazolidinyl Urea, Phenoxyethanol, Caprylyl Glycol, C.I.77491, C.I.77492, C.I.77499. Ingredients: Aqua, Glyceryl Stearate SE, Ethylhexyl Methoxycinnamate, Propylene Glycol, Glycerin, Benzophenone-3, Titanium Dioxide, Dimethicone, Cetearyl Alcohol, Butyl Methoxydibenzoylmethane, Aloe Barbadensis (Aloe Vera) Leaf Juice, Camellia Sinensis (Green Tea) Leaf Extract, Tocopheryl Acetate (Vitamin E), Sodium Ascorbyl Phosphate (Vitamin C), Polysorbate 80, Potassium Sorbate, Imidazolidinyl Urea, Phenoxyethanol, Caprylyl Glycol. Ingredients: Aqua, Glyceryl Stearate SE, Propylene Glycol, Ethylhexyl Methoxycinnamate, Titanium Dioxide, Glycerin, Benzophenone-3, Dimethicone, Cetearyl Alcohol, Butyl Methoxydibenzoylmethane, Aloe Barbadensis (Aloe Vera) Leaf Juice, Camellia Sinensis (Green Tea) Leaf Extract, Tocopheryl Acetate (Vitamin E), Sodium Ascorbyl Phosphate (Vitamin C), Polysorbate 80, Potassium Sorbate, Imidazolidinyl Urea, Phenoxyethanol, Caprylyl Glycol, C.I.77491, C.I.77492, C.I.77499. Ingredients: Aqua, Glyceryl Stearate SE, Propylene Glycol, Ethylhexyl Methoxycinnamate, Glycerin, Benzophenone-3, Titanium Dioxide, Dimethicone, Cetearyl Alcohol, Butyl Methoxydibenzoylmethane, Aloe Barbadensis (Aloe Vera) Leaf Juice, Camellia Sinensis (Green Tea) Leaf Extract, Tocopheryl Acetate (Vitamin E), Sodium Ascorbyl Phosphate (Vitamin C), Polysorbate 80, Potassium Sorbate, Imidazolidinyl Urea, Phenoxyethanol, Caprylyl Glycol. Ingredients: Aqua, Glycerin, Caprylic/Capric Triglyceride, Propylene Glycol, Cetearyl Alcohol, Glyceryl Stearate, Dimethicone, Aloe Barbadensis (Aloe Vera) Leaf Juice, Chamomilla Recutita (Matricaria) Flower Extract, Cucumis Sativus (Cucumber) Juice, Bis-Diglyceryl Polyacyladipate-2, Isopropyl Myristate, Polyacrylate Crosspolymer-6, Potassium Sorbate, Imidazolidinyl Urea, Phenoxyethanol, Caprylyl Glycol, Butylphenyl Methylpropional, Geraniol, Hexyl Cinnamal, Hydroxyisohexyl 3-Cyclohexene Carboxaldehyde, Limonene, Linalool, Parfum. 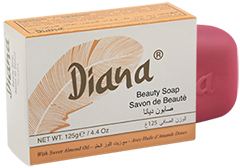 Properties: Diana® After Sun Lotion hydrates, soothes and cools the skin. Its effective formula, with Aloe Vera, Cucumber and Chamomile extracts, nourishes the skin and protects it against cracking, roughness and itching due to skin dryness. 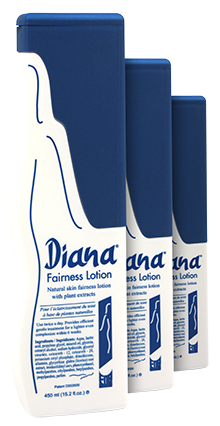 Diana® After Sun Lotion gives the skin a soft and refreshed feeling. Directions for Use: Apply the lotion on the palm of the hand. Gently spread it on the body parts that were exposed to the sun. Repeat as necessary. Ingredients: Aqua, Mineral Oil (Paraffinum Liquidum), Lactic Acid, Propylene Glycol, Cetearyl Alcohol, Glycerin, Ceteareth-12, Ceteareth-20, Glycyrrhiza Glabra (Licorice) Root Extract, Allantoin, Dimethicone, Glyceryl Stearate, Potassium Cetyl Phosphate, Imidazolidinyl Urea, Phenoxyethanol, Caprylyl Glycol, Alpha-Isomethyl Ionone, Benzyl Salicylate, Butylphenyl Methylpropional, Citronellol, Eugenol, Geraniol, Hexyl Cinnamal, Limonene, Parfum. 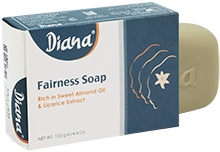 Properties: Diana® Fairness Lotion hydrates and lightens the skin tone. Its unique formula, with Licorice Extract, provides efficient gentle care for an even, bright and fresh skin complexion. Directions for Use: Use twice a day, as desired. Ingredients: Aqua, Mineral Oil (Paraffinum Liquidum), Cetearyl Alcohol, Glycerin,Theobroma Cacao (Cocoa) Seed Butter, Glyceryl Stearate, Cocos Nucifera (Coconut) Oil, Prunus Amygdalus Dulcis (Sweet Almond) Oil, Tocopheryl Acetate (Vitamin E), Dimethicone, Petrolatum,Ceteareth-12, Ceteareth-20, Carbomer, BHT, Imidazolidinyl Urea, Phenoxyethanol, Caprylyl Glycol, Coumarin, Parfum, C.I.16255, C.I.19140. 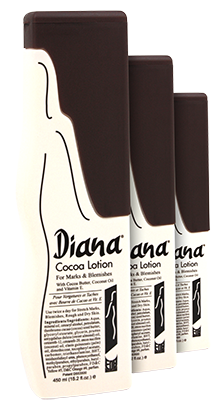 Properties: Diana® Cocoa Butter Lotion intensively moisturizes the skin. Its unique formula improves the appearance of marks and blemishes to give you an even and more beautiful skin texture. Ingredients: Aqua, Mineral Oil (Paraffinum Liquidum), Cetearyl Alcohol, Glycerin, Prunus Amygdalus Dulcis (Sweet Almond) Oil, Glyceryl Stearate, Aloe Barbadensis (Aloe Vera) Leaf Juice, Cucumis Sativus (Cucumber) Juice, Tocopheryl Acetate (Vitamin E), Allantoin, Dimethicone, Ceteareth-12, Ceteareth-20, Carbomer, BHT, Potassium Sorbate, Imidazolidinyl Urea, Phenoxyethanol, Caprylyl Glycol, Butylphenyl Methylpropional, Geraniol, Hexyl Cinnamal, Hydroxyisohexyl 3-Cyclohexene Carboxaldehyde, Limonene, Linalool, Parfum. 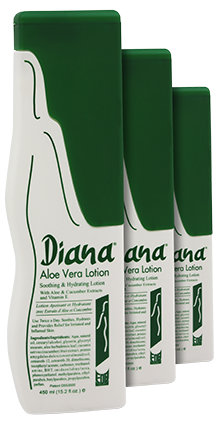 Properties: Diana® Aloe Vera Lotion hydrates, nourishes, smoothes, relieves and strengthens the skin. Its unique formula protects the skin against cracking and roughness due to dryness. Ingredients: Aqua, Sodium Laureth Sulfate, Cocamidopropyl Betaine, Cocamide DEA, Glycerin, PEG-150 Distearate, Salicylic Acid, Sodium Chloride, Chamomilla Recutita (Matricaria) Flower Extract, Humulus Lupulus (Hops) Extract, Rosmarinus Officinalis (Rosemary) Leaf Extract, Thymus Vulgaris (Thyme) Flower/Leaf Extract, Salvia Officinalis (Sage) Extract, Nordihydroguaiaretic Acid, Oleanolic Acid, PEG-60 Almond Glycerides, Carbomer, Butylene Glycol, Tetrasodium EDTA, Potassium Sorbate, Imidazolidinyl Urea, Phenoxyethanol, Caprylyl Glycol, Butylphenyl Methylpropional, Hexyl Cinnamal, Limonene, Linalool, Parfum, CI14720, CI19140. 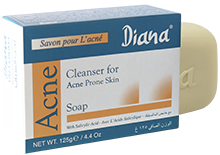 Properties: Diana® Facial Cleanser for Acne Prone Skin deeply cleanses the skin and removes oils to give you a smooth, refreshed and an energized complexion. Directions for Use: Pour a small amount of the wash on the palm of the hand. Gently massage it on the face then rinse thoroughly with water. Ingredients: Aqua, Sodium Laureth Sulfate, Cocamidopropyl Betaine, Cocamide DEA, Glycerin, Sodium Chloride, Aloe Barbadensis (Aloe Vera) Leaf Juice, Citrus Limon (Lemon) Peel Extract, Tetrasodium EDTA, Potassium Sorbate, Imidazolidinyl Urea, Phenoxyethanol, Caprylyl Glycol, Citronellol, Hydroxycitronellal, Linalool, Parfum, CI14720, CI42090. 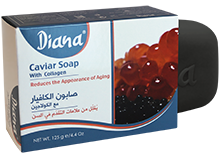 Properties: Diana® Facial Wash provides the skin with deep cleansing. It gently penetrates into the pores, dissolves dirt, oils and traces of make-up to give you a velvety and smooth complexion as well as an energizing and refreshing feeling. 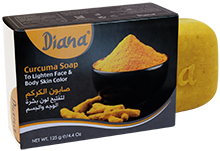 Properties: Diana® Exfoliating Facial Scrub sloughs off dead skin cells to reveal the next layer of the skin, providing your face with a smooth and glowing texture. - Wet the skin with warm water. - Gently massage the scrub 1 to 2 minutes. Avoid excessively rubbing the skin. - Rinse the scrub off your face. - Use 2 to 3 times a week, depending on your skin type. Ingredients: Sodium Palmate, Sodium Palm Kernelate, Aqua, Palm Acid, Glycerin, Palm Kernel Acid, Prunus Amygdalus Dulcis (Sweet Almond) Oil, Sodium Chloride, Tetrasodium EDTA, Tetrasodium Etidronate, Citronellol, Geraniol, Parfum, CI 12490, CI 11680. Properties: Cleanses and moisturizes the skin for a softer and smoother look. Ingredients: Sodium Palmate, Sodium Palm Kernelate, Aqua, Salicylic Acid, Sulfur, Palm Acid, Glycerin, Sodium Chloride, Palm Kernel Acid, Tetrasodium EDTA, Tetrasodium Etidronate. Properties: Cleanser for acne prone skin. Directions: Recommended for use twice a day. Ingredients: Sodium Palmate, Sodium Palm Kernelate, Aqua, Glycerin, Palm Acid, Theobroma Cacao (Cocoa) Seed Butter, Tocopheryl Acetate (Vitamin E), Sodium Chloride, Palm Kernel Acid, Tetrasodium EDTA, Tetrasodium Etidronate, Coumarin, Parfum, CI11680, CI12490. Properties: Cleanses, softens and moisturizes the skin. Ingredients: Sodium Palmate, Sodium Palm Kernelate, Aqua, Palm Acid, Prunus Amygdalus Dulcis (Sweet Almond) Oil, Glycyrrhiza Glabra (Licorice) Root Extract, Glycerin, Palm Kernel Acid, Sodium Chloride, Tetrasodium EDTA, Tetrasodium Etidronate, Citronellol, Geraniol, Parfum. Properties: Purifies and lightens skin color. Ingredients: Sodium Palmitate, Sodium Cocoate, Aqua, Sodium Hydroxide, Sodium Chloride, Coal Tar, Polysorbate 80, EDTA, Etidronic Acid. 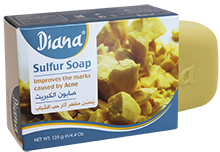 Indications: A specially formulated soap for face and body skin care. Ingredients: Sodium Palmate, Sodium Palm Kernelate, Aqua, Palm Acid, Glycyrrhiza Glabra (Licorice) Root Extract, Glycerin, Sodium Chloride, Palm Kernel Acid, Tetrasodium EDTA, Tetrasodium Etidronate, Citronellol, Geraniol, Parfum, CI12490. Properties: To lighten skin color. Ingredients: Sodium Palmate, Sodium Palm Kernelate, Aqua, Palm Acid, Glycerin, Punica Granatum (Pomegranate) Extract, Glycyrrhiza Glabra (Licorice) Root Extract, Sodium Chloride, Palm Kernel Acid, Tetrasodium EDTA, Tetrasodium Etidronate, Potassium Sorbate, Parfum, CI12490. Ingredients: Sodium Palmate, Sodium Palm Kernelate, Aqua, Palm Acid, Mamushi (Snake) Oil, Glycyrrhiza Glabra (Licorice) Root Extract, Glycerin, Sodium Chloride, Palm Kernel Acid, Tetrasodium EDTA, Tetrasodium Etidronate, Alpha-Isomethyl Ionone, Butylphenyl Methylpropional, Citronellol, Coumarin, Eugenol, Geraniol, Hexyl Cinnamal, Linalool, Parfum, CI11680, CI12490, CI74160. Properties: To lighten face skin color. Ingredients: Sodium Palmate, Sodium Palm Kernelate, Aqua, Palm Acid, Albumen (Egg White Powder), Glycerin, Sodium Chloride, Palm Kernel Acid, Tetrasodium EDTA, Tetrasodium Etidronate, Alpha-Isomethyl Ionone, Benzyl Salicylate, Butylphenyl Methylpropional, Citronellol, Eugenol, Hexyl Cinnamal, Parfum. Properties: To smooth oily skin wrinkles. Ingredients: Sodium Palmate, Sodium Palm Kernelate, Aqua, Palm Acid, Curcuma Longa (Turmeric) Root Powder, Glycerin, Sodium Chloride, Palm Kernel Acid, Tetrasodium EDTA, Tetrasodium Etidronate, Benzyl Alcohol, Benzyl Salicylate, Butylphenyl Methylpropional, Hexyl Cinnamal, Linalool, Parfum. Properties: To lighten face and body skin color. Ingredients: Sodium Palmate, Sodium Palm Kernelate, Aqua, Palm Acid, Glycerin, Citrus Aurantium Amara (Bitter Orange) Peel Extract, Sodium Chloride, Palm Kernel Acid, Tetrasodium EDTA, Tetrasodium Etidronate, Potassium Sorbate, Butylphenyl Methylpropional, Citral, Eugenol, Hexyl Cinnamal, Limonene, Linalool, Parfum, CI12490, CI11680. 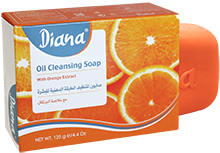 Properties: To Cleanse oily skin layer. Ingredients: Sodium Palmate, Sodium Palm Kernelate, Aqua, Sulfur, Palm Acid, Glycerin, Sodium Chloride, Palm Kernel Acid, Tetrasodium EDTA, Tetrasodium Etidronate, Amyl Cinnamal, Butylphenyl Methylpropional, Geraniol, Hexyl Cinnamal, Limonene, Parfum, CI11680. Properties: Improves the marks caused by Acne. Ingredients: Sodium Palmate, Sodium Palm Kernelate, Aqua, Palm Acid, Hydrolyzed Collagen, Hydrolyzed Actin, Hydrolyzed Roe, Hydrolyzed Caviar Extract, Fucus Vesiculosus Extract, Propylene Glycol, Glycerin, Sodium Chloride, Palm Kernel Acid, Tetrasodium EDTA, Tetrasodium Etidronate, Alpha-Isomethyl Ionone, Citronellol, Hydroxycitronellol, Linalool, Parfum, CI77499. Properties: Reduces the appearance of aging. Ingredients: Sodium Palmate, Sodium Palm Kernelate, Aqua, Goat Milk, Palm Acid, Prunus Amygdalus Dulcis (Sweet Almond) Oil, Glycerin, Sodium Chloride, Palm Kernel Acid, Tetrasodium EDTA, Tetrasodium Etidronate, Parfum, Colorants. 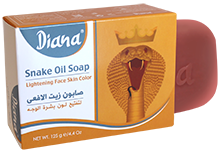 Indications: A specially formulated soap, rich in Goat Milk and Sweet Almond Oil, to whiten body skin color.